The Healthcare Information and Management Systems Society (HIMSS) conference is right around the corner. With over 1300 exhibitors and an estimated 42k-45k attendees flooding into Orlando, there is no doubt that this year’s show is going to be HUGE. The theme of HIMSS19 is “Champions of Health Unite.” Well, in order to be a champion, you need a winning team to support your Health IT transformation. Which is why Dell EMC Storage will be at HIMMS in booth #3159 showcasing our PowerMax array. PowerMax is the world’s fastest storage array with true end-to-end NVMe, multi-controller architecture, and multi-dimensional scale. With incredible performance, simple operation, and years of trusted innovation, PowerMax is the best platform for electronic health record deployments. Electronic health records have changed the way healthcare professionals treat, monitor and care for their patients. The ability to consolidate patient information onto a single platform while being able to access this information at the point-of-care improves the patient experience. To successfully deploy and maintain an EHR environment, you need storage you can trust and rely on. That’s PowerMax. As a Health IT professional, you know the storage you choose for your data center directly effects the physicians, nurses, pharmacists and technicians in your institution. These providers need access to patient information at the speed of now. This is why PowerMax offers up to 10 million IOPS and less than 300 microsecond response times, all while being architected for 6 9’s of availability. By leveraging multi-controller architecture, non-disruptive upgrades and migrations and component-level fault isolation, PowerMax has virtually zero unplanned downtime. Add to that SRDF for replication and you have true mission-critical availability, which we know your EHR environment demands. PowerMax is smart and knows that you have SLAs to meet. With the built-in, real-time machine learning engine, the array analyzes and forecasts 40 million data sets that drive 6 billion decisions per day. The machine learning engine leverages analytics to intelligently place your data on the correct media based on IO profile when Storage Class Memory (SCM) becomes available in 2019. PowerMax’s innovation works hand-in-hand with our service levels to ensure applications for your EHR deployments get consistent performance. It’s likely that in your experiences of maintaining storage in a healthcare setting you have had to manage multiple arrays. With PowerMax, those days are over. PowerMax can consolidate multiple production databases, 3rd party apps, copies and more all on a single array. To top it off, PowerMax also offers multi-dimensional scale, allowing you to scale the system up and out as your needs grow. Whether patient data increases through acquisitions or physicians taking on new patients, PowerMax has your back. Of course, when it comes to EHR environments, security is a top priority. Patient records, health information and personal data warrant the toughest security measures. With PowerMax it starts with data at rest encryption which protects your data at the drive level and easily integrates with external key managers. PowerMax is designed for FIPS 140-2 validation and meets the Advanced Encryption Standard (AES) 256. You can also utilize secure snaps with SnapVX to keep your snapshots safe by stopping any intentional or malicious deletion and have zero impact on performance. 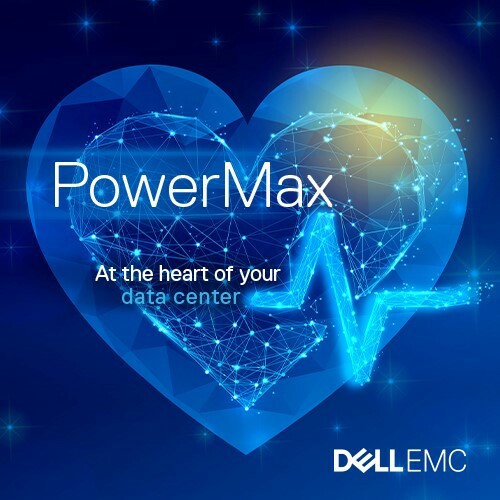 you can trust patient data is protected with PowerMax. These are only a few of the reasons why PowerMax is the best choice for EHR deployments. Let’s not forget that HIMSS takes place over Valentine’s Day this year, so come by booth #3159 to talk to Dell EMC’s healthcare experts. We would love to talk to you about PowerMax and our other technologies that. I hope to see you there. Based on Dell EMC internal analysis of published bandwidth of the PowerMax 8000 versus competitive mainstream arrays, March 2018. Based on Dell EMC internal analysis of Random Read Hits Max GB per Second (Within a single array) for the PowerMax 8000, March 2018.